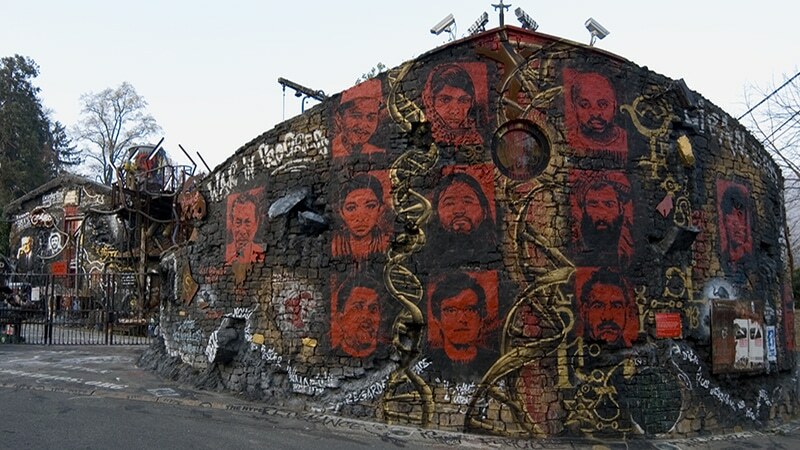 Secreting controversy, the Abode of Chaos, created in 1999, is now a much talked-about member of the Lyon artistic landscape, despite the constant threat of closure. According to the New York Times, it’s “one of the most important and most emotional artistic adventures of the 21st century”, for the mayor of the village and many others, “it’s not art, but provocation”. If you’re looking for comfort though, for a Sound-of-Music-like waltz in the cobbled countryside, do not, I repeat, do not, come here. You’ll go home a quivering mess. Its owner and Luciferian punk, Thierry Erhmann, is ever darker, having brought to the quaint little Saint Romain au Mont d’Or a post-apocalyptic battleground, where all the world’s woes are etched and vomited onto the soft golden stone of the Mont d’Or. Follow the right bank of the Saône river, trip 10 km north of Lyon, and you’ll uncover the 12,000 square metre landscape, once a 17th century post house and Protestant church. It’s scorched black and rusty now, religious symbols have been disfigured, and meteorites collide with crushed helicopter wings. From the rubble of 9/11, iron juts out like claws, surveillance cameras watch your every twitch, giant skulls loom, as do evil politicians on walls. Such concentrated hatred, anger and hypocrisy to push you to the brink of suicide. The role of art is to stir a reaction, some would say. Bah, humbug, might be the reply. 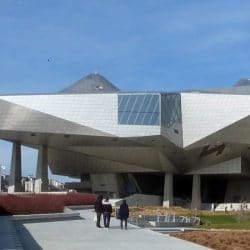 Today the controversial Abode has turned into an outdoor Contemporary Art Museum, l’Organe, where 4509 works of art by 70 different artists are on display in an environment of perpetual creation. With 120,000 visitors a year, the site is free, and you leave with a poster, a book under your arm and the chance to sign a petition to keep the Abode alive. Generosity in a world of brutes. 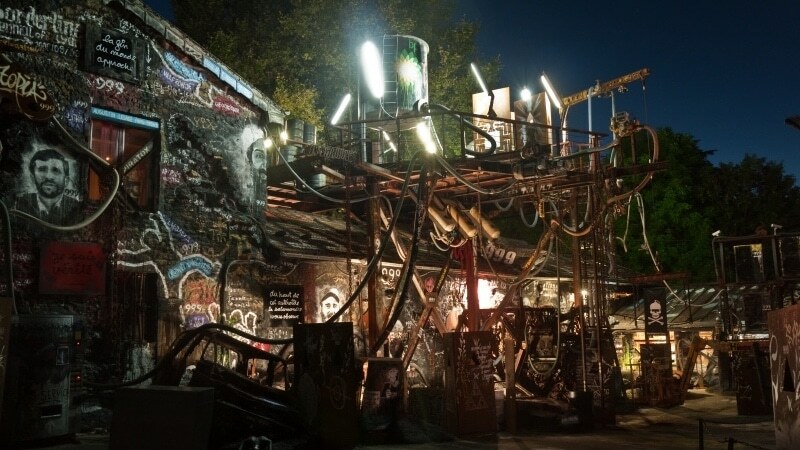 The Abode of Chaos is the brainchild of Thierry Erhmann – freemason, artist, unruly eccentric and entrepreneur. The man lives on-site and runs Groupe Serveur and Art Price amid keyboard clicks and the shrill tone of soldering iron. His ethos? “I’m trying to ‘de-legendise’ the world,” he says. He believes that if we open our eyes, the world is in constant renewal and deconstruction, there’s nothing static. So his desire is to pull apart, build on top, trample on, over and over. The “spirit of the salamander” is present in the Abode too, if you scratch at the surface. It’s the fire elemental cherished by lovers of the esoteric, a wink to Ehrmann’s Masonic links and also the symbol of Groupe Serveur, showing the blatant absence of division between business and the personal. For a time, the courthouse was more home for Erhmann than St Romain au Mont d’Or, where lawsuit after lawsuit, coupled with the tenacity of local residents, dragged him in by the scruff of his neck. In 2009, France’s highest court, the Cour de Cassation, ruled that Erhmann would have to put the Abode back to its pre-chaotic state. Erhmann refused. A few years later, a hefty fine had to be paid daily. Erhmann refused. Lawsuits piled up, one on top of the other, until 2016, where Erhmann saw the Abode of Chaos protected by a law on freedom of creation. How long it will last, perhaps only the salamander knows. So if you’re looking for a quirky kind of destruction and you’re not squeamish, tootle on up the river Saône. It’s sure to engrave itself on your mind a while. If you’re taking kids though, prepare a lullaby and a security blanket for after. Opposite the Abode of Chaos is the Abode of Eden, where a local resident has tried to counter the destruction by his own brand of joy. Worth a fleeting look to lift your spirits. If you’re coming by car, head for lunch or supper at the Auberge de Polimieux a few miles away. It’s run by fiery tempered yet welcoming females. Open fire for the cold, hearty and affordable meals, and a terrace to shield you from the summer heat. Open every weekend and Bank Holiday. - January to February: 2.00pm to 6pm. - March, April, May: 3pm to 6.30pm. - June, July, August: 4pm to 8pm. - September: 3pm to 6.30pm. - October, November, December: 2.30pm to 6pm. Bus: Number 43 from Gare de Vaise train station. Get off at Saint Romain Centre and walk. Car: Take Quai Clemenceau and head north of Lyon towards the Monts d’Or. Follow the right bank of the Saône river.